Saxby Smart has been called the new Encyclopedia Brown. He certainly is an updated, more modern boy detective. Like Encyclopedia, he offers readers a chance to solve his cases and uses logic and research provide clues and ultimately the answer. His stories are much longer - only three to a book, rather than the usual ten of Encyclopedia's cases, but he asks readers questions throughout the story, not just at the end. Unlike Encyclopedia Brown, Saxby never does anything a normal child couldn't do. Adults don't automatically listen to him, he does his detecting after school, and he has to tell his parents where he's going. Saxby's not an encyclopedic genius either; his friend Isobel does all his research and Saxby admits that he "skip[s] stuff" and he "can't tell a fulcrum from a plate of spaghetti. His main qualification seems to be the number of detective stories he's read, including Sherlock Holmes, Philip Marlowe, and Nancy Drew. In other words, Saxby is boring. He tediously takes the reader through every part of his lengthy thinking processes, every deduction, every logical step. There are some humorous moments in the story, but while this would make an excellent accompanying text for a child's course in logic, it's not much of a story. 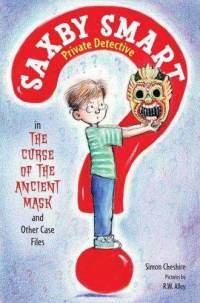 The reader's conclusion is that if they can figure out the answer, any other child could and since Saxby doesn't do any of his own research or much actual detecting, he's pretty superfluous. Encyclopedia still rules! Verdict: Beginning chapter readers are always looking for mysteries, but I would stick to the classic Encyclopedia Brown and the newer, popular A to Z Mysteries and others. Candy is a beautiful thing. There's the little crunchy candies, and melty chocolates and candied fruits and....but these are temporary things. They crunch, they melt, they goo, and it's over. For real satisfaction, there's nothing like a cool bowl of ice cream. You can't eat it too fast or it's too cold. You can't leave it and come back or it will melt. That's also Patricia Wrede's newest book, Thirteenth Child. Now, I don't usually bother to talk about books everybody else is reading/reviewing. I mean, you're all reading them already, right? Right? But this book is just so satisfying, so perfect. It's not a fast-paced adventure story - the plot builds slowly and the only really exciting action comes at the extreme end. But it's so perfectly written that you simply can't become bored, you're inevitably dragged along until you join Eff in her sudden epiphany....and then the book ends! And you realize you are going to have to wait some time for the sequel! And you go find some ice cream. For those most familiar with Willo Davis Roberts as a writer of mysteries, this book will be a surprise - it's one of the two stories she wrote about abused children. The other, Don't Hurt Laurie, is a story of physical abuse, while this painful novel is more about neglect and emotional pain. Something happened to David's family a long time ago - his parents don't even seem to like each other anymore and he feels more and more that he's in the way. Now his parents have decided to go their separate ways over the summer and have finally settled their plans. Until his dad realizes they haven't planned anything for David, who suddenly finds himself left in a small town with his strange grandmother, Ruthie. With his caring grandmother, David starts to see possibilities for his future and gains the courage to stand up to his parents and choose for himself where he belongs. Like her other "problem novel" the story never stereotypes or simplifies problems. David doesn't simply forget his parents or the pain they've caused him and his new friends have their own problems and failures. But Roberts writes convincingly of hope for the future and of the importance of compassion. Verdict: This story is well-written and intriguing, but the cover is painfully outdated. An interesting personal read, but you might as well weed it. In these three retellings of Greek myths, Clemence McLaren speaks from the female point of view and reworks these classic stories into happily-ever-after romances. Atalanta's challenger is from the north of Greece, an enlightened Thracian who promises not to keep her a prisoner in her own house. Andromeda is rescued both from the sea serpent and from her unwelcome marriage by the golden hero Perseus, who she has been daydreaming about. Finally, Psyche wins the love and trust of her husband Eros and becomes an immortal. The author also includes an epilogue with more information on Greco-Roman culture and the context of these three myths. Verdict: Fans of Percy Jackson may be disappointed, but those looking for more romantic mythological retellings might enjoy these rather pedestrian retellings. Looking at my popular series characters (and not counting the sparkly ones) for beginning chapter books, the hapless male seems to be in. Horrible Harry is still going strong, Roscoe Riley is a new hit, even Diary of a Wimpy Kid, all feature more or less ineffectual boys. Whether or not they mean well, things always go wrong. Well, a new character is on the scene; a tough UK import, Horrid Henry makes sure that things always go wrong - for everybody else! These beginning chapter books are composed of four individual stories, each about a boy who revels in mischief and delights in his horrid behavior, to the despair of his helpless parents and teachers. A huge hit in the UK, with his own tv show, Horrid Henry may find the going a little rougher over here. The heavy publicity has a somewhat frantic note, to my mind; continued emphasis on Henry's popularity in the UK doesn't necessarily translate to popularity in the US. I feel Tony Ross' illustrations to be a poor imitation of Quentin Blake although some kids seem to enjoy them. The writing is somewhat flat and the adult characters are Dahlishly exaggerated and one-dimensional. Henry's unremitting enjoyment of his horridness becomes stale after continued reading and he begins to come across as a somewhat lonely, unhappy and extremely irritating and nasty little boy. Verdict: This is an updated verdict - these have not been particularly popular. Kids are perfectly happy with Roscoe Riley, Horrible Harry, Ready Freddy, and similar stories. I've seen a couple parents veto this selection and it doesn't seem to be a good fit for our library. Horrid Henry's Perfect Day: Henry decides to behave perfectly, and discovers that it makes everyone else even more upset than when he's Horrid. Horrid Henry's Dance Class: Henry sabotages his dance class and gets kicked out, much to his delight as he wanted karate lessons instead. Horrid Henry and Moody Margaret: Henry meets his match in the changeable and aggressive Margaret when they try to play together. Horrid Henry's Holiday: Henry, as usual, is unhappy with his parents' choice of holiday but when he tries to help out, they end up in the perfect holiday spot. Horrid Henry Dines at Restaurant Le Posh: Henry only eats burgers. But his parents insist on dragging him to a fancy restuarant for a family dinner. Henry is ready to revolt, but he can't let Stuck-Up Steve, his cousin, win over him with a mean trick! In the end, only Henry enjoys the fine dining. Horrid Henry Tricks the Tooth Fairy: Everyone but Henry has lost a tooth, even Perfect Peter! Henry is determined to trick the Tooth Fairy somehow, but for once his tricks don't work! Horrid Henry's Wedding: They're forcing Horrid Henry to be a ring bearer and wear awful, silly clothes! Well, they want him at the wedding? They've got him in all his horridness. Moody Margaret Moves In: The only person nastier than Horrid Henry is Moody Margaret, and she's coming to stay for two weeks! Will Horrid Henry - and his family - survive? Horrid Henry's New Teacher: It's time to break in a new teacher - and Horrid Henry knows just how to do it! This was the only story I found really funny, Henry shows a wickedly inventive imagination in this tale! 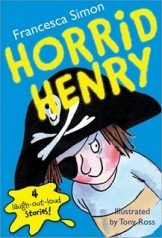 Horrid Henry Reads a Book: Reading? Henry hates it. But for a ticket to a theme park, he'll do anything! Horrid Henry's Stinkbomb: Horrid Henry and Moody Margaret attack each other's clubs; but there are traitors in their midst! Horrid Henry's School Project: Horrid Henry hates working in groups. He'd do much better on his own....and he does! From his point of view, of course. Horrid Henry's Sleepover: Nobody ever has Horrid Henry over for more than one night, so Henry is thrilled when the new boy invites him over. He has plenty of horrid things planned but somehow they all go awry! Cora's family loves to cook, and everyone has a special job. Except Cora. She's too small to do real jobs like shredding chicken or slicing vegetables. 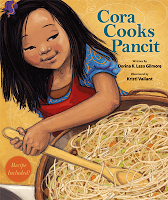 But one day everyone is gone except Mama and Cora has the chance to try all the cooking jobs she's been longing to do....because Mama is going to teach her to make Pancit! This warm family story is full of delicious love and geniune childish emotions. Pancit is more than just a yummy dish, it's a family recipe that incorporates the history of Cora's family. Every child who's longed to be part of a family tradition or do something grown-up will sympathize with Cora's excitement and trepidation. The illustrations are glowing and realistic, incorporating a variety of designs, from full-page spreads to small insets in a contemporary but accessible style. The book also includes a glossary of the Tagalog words used (check it to see how to pronounce pancit before reading this story aloud!) and a recipe for pancit. Verdict: A warm and embracing family story that a variety of ages and traditions can sympathize with. Recommended for family and storytime reading. I am a huge fan of Steven Kellogg. I adore the Jimmy's Boa stories, I laugh over his retold folktales, and I enjoy his exuberant and detailed illustrations. 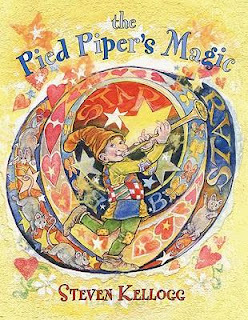 However, I am sadly disappointed by his newest book, Pied Piper's Magic. The illustrations are as fresh and colorful as ever, but the humorous and charming details are missing. And the story...well, this isn't the classic Pied Piper story. A small elf named Peterkin comes across a depressed and lonely witch named Elbavol. He fixes her house and she gives him a magic flute. He discovers that it plays words and whatever words he plays, that thing appears. He arrives at a city where the cruel Grand Duke makes all the parents work in factories and all the children sweep the multitudes of rats away from the monuments. He offers to get rid of the rats and give the reward to the people. He pipes up all the rats, then plays backwards and turns them into stars. He then takes the cruel Grand Duke out to Elbavol's cottage, plays backwards, and everybody becomes Lovable. The plot has several holes in it - originally he creates the different animals he pipes up - is he then creating the rats? Why does his pipe suddenly call them? If piping the witch's name backwards makes her Lovable, why does that affect the duke? Now that no one is working in factories, exactly how is the city surviving - and buying all that fancy paint to decorate everything? Verdict: My main regret is that Peterkin doesn't continue to play backwards, contract that dread disease named Nikretep, and expire of the story's sickly sweetness. 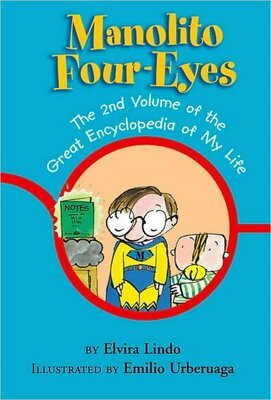 Manolito returns in "the 2nd volume of the great encyclopedia of my life." Funny, gross, warm, and exuberant, Manolito opens the window to another culture while showing how some things stay the same; school, family, and getting into trouble. The Manolito stories are hugely popular in their native Spain and there are some parallels to the Wimpy Kid books - cartoon-style drawings and some snarky humor. But Manolito lacks the self-awareness of Jeff Kinney's characters and his somewhat innocent, naive approach to life is closer to the French Nicholas of Goscinny. These books will definitely have a more limited appeal than the Wimpy Kid stories, but there's plenty of humor to attract young readers. Bloodhound by Tamora Pierce. I was a very, very good girl, and only looked at the cover blurb. It looks very goooood. Thirteenth Child by Patricia C. Wrede. It feels like FOREVER since a new Wrede came out! I can't wait for it to be catalogued! Something Maybe by Elizabeth Scott. I just like the cover - I'm really into hats. Lauren Child's I completely Know About Guinea Pigs. Bert is soooo cute! I showed this to my sister (librarian's sisters have privileges too, you know) and we both went nuts over it. "Bert's gone tiny!" Snerk, giggle. Same Same by Marthe Jocelyn. A really fascinated concept book - can't wait to show this to my colleague who does baby and toddler storytimes. Nic Bishop Butterflies. Ooooh, gorgeous! Lots more, of course, but these are the ones I'm really bouncy about! Of course, there are also disappointments and confusions.....I ordered a couple of the Boxcar Children graphic novels and....my first thought on picking one up from the box was "oh, they've sent a promotional pamphlet." Nope. That's the book. I am sooo not buying anymore. I also had somehow gotten it into my head that Obi, Gerbil on the Loose by Delaney was a picturebook - nope, it's a chapter book. And, aaargh! one of my new Scooby-Doo chapter books turned out to be Spanish. Not what I had in mind. But a very lovely opening of boxes all the same! Aliens! Monsters! Lost Library Books! Alistair is a Very Good Little Boy. He's always clean, always on time, always organized. He always knows just what to do. Which is good, because this Very Good Little Boy ends up in some straaange situations. Only Alistair, on his way to return library books, would get kidnapped by aliens! (Fortunately, he's an excellent navigator and gets them all home safely). Only Alistair would end up with an elephant, find previously unknown monsters while scuba diving, or be able to deal with an alien invasion. The completely insane situations contrasted with Alistair's consistently deadpan face and Very Good Behavior, will keep you giggling all the way through! Verdict: Although these books are older, they're not at all outdated. Great fun if you find a used copy or buy the still in print paperback. Firstly, because they chain kids into reading books by their reading level, not by interest or appropriateness. Secondly, because they MAKE NO SENSE. So, a kid about thirteen comes in. He is supposed to be reading around 1000 level. He's "allowed" (I gnash my teeth) to read down in the 900s. He loved the Hobbit (L1000). Can he read Fellowship of the Ring? Nooo, it's L960. But he can read Paul Hutchens Sugar Creek Gang series! L1500. And why is this truly ancient series L1150? Because Paul Hutchens wrote fairly short stories about Christian boys and their adventures without any punctuation and his sentences would go on and on for sometimes more than a paragraph without a break and this apparently makes him a more challenging author than Tolkien. So, we return to the book of lists. What about something called Ghost Liner? It's L1100. It's also only 64 pages. "What's this, The Native?" Trust me, you wouldn't like Thomas Hardy. How about Gordan Korman, I like him. Nope, too low. It is a wonder any children still retain the faintest interest in reading after this. E. B. White wrote a hilarious and pointed essay (the title of which I cannot remember) about checking his writing on a fancy new machine that measured the difficulty of your writing. The machine's conclusion? White's writing was practically infantile. The machine's instruction booklet was measured too hard for anybody to read. Oh, and the whole "it challenges kids" argument parents keep giving me? Toss your reading levels and bring your child to me. I personally promise to challenge their reading ability AND find them books they actually want to read. I am a huge fan of Krista Ruepp and Ulrike Heyne's lovely horse picturebooks, featuring a small Icelandic girl and her beloved pony. To my delight, I discovered they had created some early chapter books! The stories are simple but elegant, showing the characters' unique personalities and love of their island home in every line. The pictures, as always, are marvelous, the horses' wild manes and frothy waves showing the harsh but exuberant life of these northern islanders. 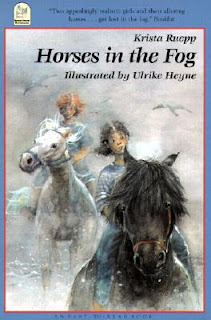 These lovely stories are perfect for the young horse-lover. One of my favorite funny authors is Gerald Durrell. Many people are familiar with his classic, My Family and Other Animals, and its telling of his eccentric family's sojourn on the island of Corfu. But there's a whole series of hilarity to follow, as Durrell grows up and follows his dream of becoming a zookeeper, first as an assistant, then as an animal collector for zoos, and finally in his own zoo. Through all his adventures, exhausting, stressful, and dangerous, Durrell maintains an exuberant interest and curiosity not only in the personalities and lives of the many animals he encounters, but also in the local people. Hilarious anecdotes of traveling mishaps, miscommunications, local bureacracies, and animal antics are interspersed with a real concern for the welfare not only of animals but also of the coexisting humans. Verdict: If you like animals, travel stories, and lots of laughs, you'll enjoy Gerald Durrell! A recommended family read-aloud! I don't like Arthurian stuff. I just don't. It's messy and tragic and all those knights are confusing and I had a bad run-in with the literary symbolism of Sir Gawain in college and if you read the older stories the language is impossible and if you read the new ones they sound dumb....you get the point. But. 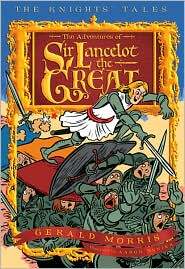 I have found an Arthurian series I like. In fact, I laughed myself sick (literally, since I had a bad cough when I first read this and laughing set it off. very painful). And it's a beginning chapter book! Not enough of them around, especially good funny ones like this! Verdict: Not to be read while drinking milk. This is a recent find of mine, casually scooped up on Bookmooch because sometimes Yeoman is very funny. 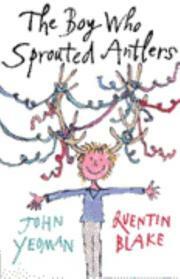 And it's illustrated by Quentin Blake. So, you know how teachers and other well-meaning people are always telling kids they can do anything if they just work hard enough...live up to your potential....and so on and so on? Well, this little boy TOTALLY BELIEVES his teacher. But while her idea of doing anything he wants if he just works hard enough is improving his schoolwork (specifically his basket-weaving in art)....He's got something a little more interesting in mind. Yeoman's characterization is absolutely perfect - I can completely see kids talking like his characters! I laughed and laughed and laughed. Never mind the publisher's blurb on the back saying it's a book about "being different." Nope, this is a totally wacky book that's just FUNNY. And what more do you need? Verdict: Sadly out of print, and while used copies are readily available, they are generally paperbacks. 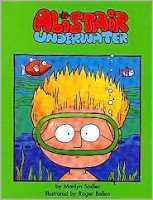 If they ever republish this one in the US, I would pounce on it.